Shirley Holmes is the great grand-niece of the world famous detective Sherlock Holmes. She is twelve years old and committed to carrying on her ancestor's legacy. She is brilliant, ingenious and tenacious. Shirley must solve mysteries. It's a passion: it's what life is about. The dark corners that others like to avoid are the very places she wants to be. Shirley was born in England, but when she was just a baby, her father, Robert, was offered a posting at the British Embassy in Redington. Robert and his wife Joanna, jumped at the opportunity; Joanna was Canadian, and this would bring her closer to home. Peggy Holmes, Shirley's grandmother, moved with them; she was always ready for a new adventure. Shirley attends the prestigious private school Sussex Academy, in Redington, the nation's capital. She loves English, Science and History - although she is often at odds with many of her teachers. Shirley loves spirited discussions and never accepts anything at face value. The headmistress of the school Ms. Stratmann finds Shirley "frequently tardy and sloppy in her appearance. She seems unable or unwilling to follow the rules." Well - it's true she is often late, but she can hardly dash off to school when she is in the middle of a case. But since Ms. Stratmann doesn't know she's a detective (nor do any adults), she can't really explain. Meredith began taking acting classes and working in amateur theatre at the age of five. Her parents, both active in amateur theatre, encouraged all their children to participate in drama classes in school and in extra-curricular programs. At the age of nine Meredith decided she wanted to audition, which led her to her first role as the star of the television movie SONGSPINNER. 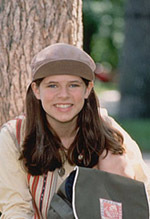 Before she was cast as the enigmatic Shirley Holmes, Meredith guest starred on the YTV series GOOSEBUMPS and narrated a CD-ROM for the Ontario Ministry of Education. 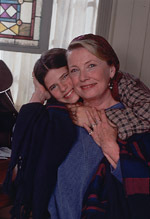 In the spring of 1997 Meredith starred in the feature film KAYLA. "She's really cool." Meredith says when asked about Shirley, "Shirley Holmes is smart and she likes to show people how clever she is. She is inquisitive and she is driven. She is also a loner and doesn't care what people think about her. She just does what she wants to do. Shirley Holmes is a lot like me. I am not as inquisitive as her, but I still want to know about things." "The character of Shirley has really grown and deepened over the last two seasons, and Meredith has grown right along with her", says Producer Helena Cynamon. "She has gained tremendously in confidence and had a lot of fun this year with all the challenges we threw at 'Shirley'." Meredith Henderson lives in Vancouver with her Mom. She enjoys singing, jazz dancing, swimming and she loves animals. Bo Sawchuk is Shirley's "Dr. Watson". As a detective, Bo tends to jump to obvious conclusions, while Shirley is always challenging him to dig deeper. But to his credit he is new to this game and has a lot to learn. He has some very useful skills from his past life as a member of a street gang. Bo and Shirley met in an after-school detention. It was Bo's first day at Sussex Academy and already he was in trouble. Shirley was in detention for "tardiness". At first glance Bo had pegged Shirley for just another snobby rich kid - but when she made a few careful observations about him and his life - he was suitably impressed. But when Shirley goes one step further and proves his innocence in a string of local arsons - Bo is hooked. Slowly Bo and Shirley become inseparable and platonic friends, even though he still thinks she is weird. And way too rich. John White was eight years old when he, his sister and mother participated in the annual Christmas play at Toronto's Trinity Church. It was just for the fun of it, but three months later they received a phone call from the director, who was also a TV commercial director, wanting John to audition for a commercial. He was told "absolutely not". After several months of persistent phone calls, Mrs. White finally agreed to a meeting and by the time John was ten years old he was working regularly. His credits include the Showtime Networks productions THE LEGEND OF GATOR FACE, JOHNNY & CLYDE; the Canada/Germany co-production of BLUEHAWK; and the television series: KUNG FU, GOOSEBUMPS, THE MIGHTY JUNGLE, and ARE YOU AFRAID OF THE DARK?. John recently completed the movie THE FIXER where he starred opposite John Voight. "John is so talented and so natural in front of the camera. He came on this show in the first season and created his character with a dry wit and an ironic sense of humour. He understood immediately what was expected of him. ", comments Producer Kim Todd. John lives in Toronto. He is an avid (and very competitive) baseball player, and loves skiing, swimming, roller blading and road hockey. Molly Hardy is a dream come true for Ms Stratmann, the Headmistress of Sussex Academy. Molly is a natural born leader, beautiful, polite, attentive - and rich. And she always receives the highest grade-point average in the school. But unlike most thirteen-year-olds, Molly's only motivation is power. Receiving the highest grade-point average does not leave Molly Hardy with an sense of inner pride and accomplishment - her only feelings are those of greed and manipulation. The highest grades mean simply that her parents will defintely give her an increase in her already substantial allowance and the Headmistress Ms Stratmann will continue to be "putty" in her hands. The other students of Sussex Academy are either thrilled to have Molly include them in her clique, or devastated by their exclusion. Thus Molly retains power and control within the school, allowing things to go exactly her way. But - there is always one flaw in Molly's perfect plans, and her name is Shirley Holmes. Shirley does not care about peer pressure and cliques. She does not join clubs. She does not care how she dresses. And yet, infuriatingly, kids still seem to like her, or at least, respect her. And so Molly becomes Shirley's nemesis, her own "Moriaty". She is as brilliant as Shirley and as driven. But while Shirley is driven by passion and a desire to help those in need, Molly is driven by power. The role of Molly Hardy is Sarah Ezer's first television role. A relative new-comer, Sarah's interest in acting began only eighteen months before she landed the role of Molly Hardy. Sarah was a provincially rated track and field athlete in her home province British Columbia but a knee injury forced her to put her athletic dreams on hold. Following her first audition, she received a call back the next day and was cast in an international commercial for Hasbro Toys. Sarah continued doing commercial work for a number of months, found a new agent and is now auditioning for television and film roles. Sarah is bilingual, speaking both English and French, and loves soccer, swimming, basketball, and tennis. She lives in Vancouver with her mom Elizabeth. Alicia is Shirley's Phys. Ed. partner. They get along well (even though Shirley cannot begin to understand Alicia's obsession with boys). Alicia is Italian. Her dad is the Italian Ambassador in Redington. Alicia and Shirley have shared many a boring time at the seemingly endless diplomatic functions their fathers are required to attend. Alicia has lots of connections in the Italian community, both in Redington and worldwide. She also has a great knowledge of Italian history. She is also easily swayed by peer pressure and therefore by Molly Hardy. Shirley knows she cannot always trust Alicia. Since the age of three, Annick Obonsawin wanted to be on television. "Her idols were Sharon, Lois and Bram," comments Annick's mother, Carol, "she would watch the SL&B television show and she would say "I can do that". She has always loved to sing and dance." Annick, who is totally bilingual, began her career when was eight years old on TV Ontario's french television station. From there she went on to two seasons on the PBS series Lambchop's Play-Along with Shari Lewis; one season of the french version of Dudley The Dragon; and one season on the YTV series Squawk Box. In 1995 Annick has completed work on one episode of Goosebumps and the feature film It Takes Two. and in 1997 had a lead role in the Vancouver produced movie "Silence"
Annick lives with her mom, dad and sister in Unionville, Ontario. Her favourite singers are Alannis Morrisette and Celine Dion. Stink Patterson is the class clown. His dad is the owner of "Laugh Riot", a nationwide chain of novelty stores, where the biggest selling items are whoopee cushions and fake dog poop. His sense of humour is of the same calibre. Stink doesn't play favorites - the world is his victim and there is more than enough whoopee cushions to go around. Sometimes his dumb jokes impede Shirley's investigations and sometimes without even knowing it his fake spiders and booby-trapped desks have given Shirley the opportunity to go one step further in her sleuthing. 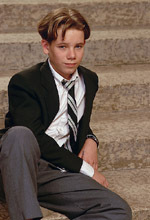 Brendan first professional acting job was the starring role of "Des", the violent and frightening young offender, in the 1996 CBC television movie Little Criminals. 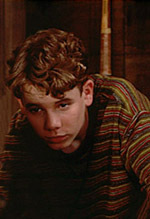 Critics hailed his performance as "astounding" and the industry agreed awarding Brendan with the 1996 Leo Award (British Columbia) for Best Actor in a Dramatic Program. "When you asked Brendan what he wanted to be when he grew up, from the time he was three-years-old, he would say he wanted to go to Hollywood and be discovered" laughs his mother Tammy, "he has always loved being on camera and performing for an audience". Since completing Little Criminals, Brendan has been working almost constantly. His resume includes lead roles in the movies Summer's nd and Rollercoaster, plus CBs television movies The Oath and Family Blessing and the popular YTV series Goosebumps. Brendan lives in Courtney, British Columbia with his mom, dad, brother and sister. Yes - he knows his name is ridiculous. Bart is a shy boy and a bit of a "nerd". 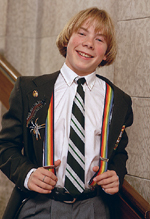 During the school election his idea of a winning campaign platform was "new keyboards and modems for the computer club". Needless to say he is a little out of touch with the masses. Bart is an avid admirer of Shirley and her detective skills. He is in awe of her and respects her, but also finds her (and most of the world) intimidating. Sometimes Shirley will give him a simple task to do - but it always amazes her how someone as smart as Bart can still find a way to muck everything up. But there's something ingratiating about him. Besides, he is an expert on the supernatural. If you need to know about UFO's, crop circles, paranormal experiences, ESP or alien abductions - Bart's your man. Blair Slater as "Bartholemew (Bart) James III"
"Blair has always loved to perform" states his mother Marion, "He would put on little shows for us at home when he was really little. He'd act out all the parts in these shows with a number of characters. It was great." Blair began working in amateur theatre at the age of six. He then began doing commercials and worked as an extra on a number of television shows. He quickly moved into bigger roles for television which includes principal roles in the television series Sliders and The X-Files. He has also appeared in the television movies Bye Bye Birdie, The Annette Funicello Story, Diana Kilmury: Teamster and In The Lake Of The Woods. 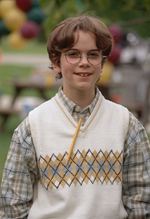 He recently had a role in the hit move "The Truman Show", playing the role of the young Truman. Blair loves working as an actor and recently told his mom "I love this mom. It's like getting paid to breathe". "Blair lives in Vancouver with his mom, dad and sister. Robert Holmes is a career diplomat and has been stationed in British Embassies around the world. He is forty-two years old and currently holds the position of Deputy High Commissioner of the British Consulate in Redington, the capital city where he lives with his daughter Shirley and his mother Peggy. Robert Holmes can best described as a stuffy upper-class Brit, who graduated from Cambridge University, has a preference for ascot ties and loves the games of croquet. Despite these attributes, he, and his wife Joanna, raised their daughter Shirley to be curious and spirited. 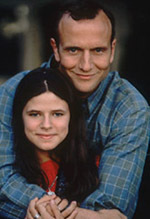 Although they nurtured these qualities, Robert knows they do get his young Shirley into trouble. Robert loves his daughter deeply and is very proud of her, but he fears that as she grows up her strong-willed nature will clash with societal expectations. While he doesn't want to dampen her spirits - he also wants her to get along in the world. Chris was born in Toronto and lived in Los Angeles until he was seven, but has spent most of his life in England. He came to Canada in 1991 to pursue an acting career for Canadian and American film and television. He lists the NBC/BBC mini-series ANNO DOMINI; the 1994 Theatre Calgary production of HAMLET; and a three episode run in the immensely popular Granada television series CORONATION STREET as his favourite roles. Chris has written two plays: GLIMPSES OF THE MOON which was performed by Calgary's Lunchbox Theatre in 1996 and A CAGE WITHOUT BARS which was selected by Vancouver's New Play Centre and workshopped there in 1993. Chris recently appeared as Lord Mountbatten in the theatre production ALWAYS in London, England. Chris lives in London, England with his wife Aletha. At sixty-eight years of age, Peggy Holmes, has led and continues to lead, an amazing and eclectic life. An avid jogger and twenty-year tai-chi veteran, Peggy Holmes, also holds the subjects of archaeology, history and ancient languages close to her heart. Peggy Holmes studied Archaeology as a young woman, but given the times she grew up in, she never had a "career". Instead, she travelled around the world with her husband Sebastian Holmes, a world famous neurologist. Wherever they went, Peggy would find the nearest archaeological site and dig right in. Her son Robert (Shirley's father), travelled with his parents as a young child, but then went on to boarding school in England. When Sebastian died, Peggy joined Robert, his wife Joanna and the one-year-old Shirley, in Redington - partly for the adventure, partly because she wanted to make up for the years when continents separated her and her son. Peggy has never looked back and cherishes the oportunity to be a part of her granddaughter's life. Shirley depends on her "Gran" as a wellspring of knowledge and wisdom, and as an anchor. Theirs is a relationship of equals. British by birth, North American by choice, Elizabeth Shepherd has enjoyed a long and distinguished stage, television and feature film career. She began her career in England, and of that period she describes herself as the "queen of the BBC mini-series" starring in BLEAK HOUSE, BUDDENBROOKS and THE BIRDS FALL DOWN. The role of "Cordelia" in William Hutt's first production of KING LEAR at the Stratford Festival brought Shepherd to Canada in 1972 and she has lived in the country ever since. Shepherds resume is extensive and includes stage performances in New York, both on and off Broadway, plus appearances in London's West End, at the Stratford and Shaw Festivals, at San Diego's Old Globe Theatre and at the Bristol Old Vic. She has played the Shakespearean roles of Juliet, Lady MacBeth, Viola, Portia, Titania, Ophelia, Gertrude, Cordelia, Helena, Isabella, Beatrice and Hermione and been seen on television in ALL MY CHILDREN (ABC), THE DUCHESS OF DUKE STREET (BBC), SPENCER FOR HIRE (CBS), THE CITADEL (Granada) and THE ROAD TO AVONLEA (CBC). Shepherds credits also include roles in the feature films THE TOMBS OF LIGIA, with Vincent Price; DAMIEN: OMEN II, with William Holden; DOUBLE NEGATIVE, with Anthony Perkins; INVITATION TO THE WEDDING, with Sir Ralph Richardson and Sir John Gielgud; CRIMINAL LAW, with Gary Oldman and Kevin Bacon and PRESUMED INNOCENT, with Harrison Ford. The favourite roles of her career have been 'Blanche' in A STREETCAR NAMED DESIRE, 'Queen Katherine' in HENRY VIII and 'Virginia' in the one-woman show IMMEDIATE FAMILY. For her performances Elizabeth has received an Emmy nomination for THE WINTER'S TALE (WNET/PBS), an Anik nomination for THE FIRST NIGHT OF PYGMALION (CBC) and a Gemini nomination for THE CUCKOO BIRD (CBC). Since the first season of THE ADVENTURES OF SHIRLEY HOLMES, Elizabeth has appeared in the feature film THE WHITE RAVEN which was shot in Warsaw and starred Ron Silver and Joanna Pacula; plus the television movies KILLING ME SOFTLY for the Lifetime Network and LET ME CALL YOU SWEETHEART for the Family Channel in the U.S.. She also starred in the theatre production MY MOTHER'S COURAGE at the Theatre Passe Muraille in Toronto where she received magnificent reviews. Robert Cushman of the Globe and Mail reviewed her performance by writing, "Elizabeth Shepherd's performance ... is magnificent, possibly the finest piece of acting I have seen in Canada." Joanna Holmes, a Canadian, met her husband Robert, while both were studying at Cambridge University. She was a spirited farm girl from Western Canada studying medicine. While she would have nothing to do with the pomp and snobbery of the distinguished British college, she nonetheless fell in love with the stiff, formal Brit - Robert Holmes. As Robert worked his way up the diplomatic ladder, Joanna built a reputation as a world-class virologist. And when they were both thirty, Shirley was born - it was the happiest day of their lives. At the time of her dissappearance three years ago in Rwanda, Joanna Holmes was thirty-nine years old. Joanna was on assignment for the World Health Organization (WHO) and was last seen at a refugee camp outside the Rwandan city of Kigali. Joanna went to Rwanda when she received a phone call from the WHO regarding an outbreak of a deadly virus in the countries refugee camps. The assignment was to last for three months. A week before her scheduled return to her family, Robert, Peggy and Shirley received the news - Joanna had dissappeared. Fighting had broken out in one of the camps and many people were killed. Her body was never found. Joanna Holmes was presumed dead, but Shirley refused to believe it. At the end of Season 3, Shirley and Robert travelled to Rwanda on news of a viral outbreak being contained in the Rwandan jungle, eventualy reuniting with Joanna, who, as Shirley had believed, was still alive.